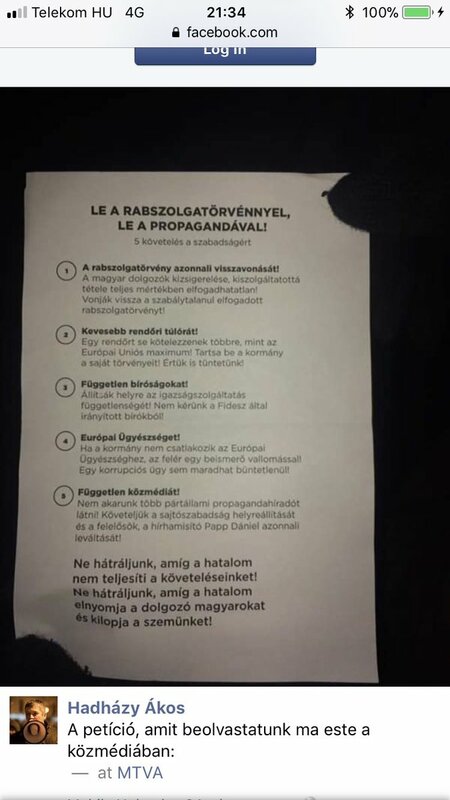 Last week, Viktor Orban's authoritarian government rammed through a pair of massively unpopular laws: the "slave labor" law (employers can require up to 400 hours/year of overtime, and take up to three years to pay for it); and a law creating a parallel system of "administrative courts" dealing with "government issues" like voter fraud, overseen by political appointees from within Orban's regime. The protests that thronged the streets have not abated: thousands have continued to march, braving brutal police crackdowns, including kettling, gassing, and beatings. Recent protests focused on the state TV broadcaster. Opposition MPs were violently dragged from the state TV headquarters after they attempted to read a petition against the slave labor law over the air. Orban is part of the global wave of corrupt strong-man autocrats who have swept to power -- see also Trump, Erdogan (Turkey), Duterte (Philippines), Bolsonaro (Brazil), etc -- by targeting economically insecure victims of neoliberalism with racist messages and conspiracy theories about George Soros. Clashes with police began when protesters arrived at the headquarters of state-run television station MTVA and tried to storm the building, CNN affiliate ATV Hungary reports. Video and images show officers in riot gear firing tear gas into the crowd during the confrontation. Live-streamed video posted by ATV Hungary showed reporters trapped in a crowd of protesters unable to move, as well as people crouched on the ground temporarily blinded by the tear gas. Hungarian MPs removed from offices of state-run TV station.